It's decades since they made a new record, but that doesn't mean they shouldn't. Jeremy Allen is seduced by a night of nostalgia and goes home wanting more. 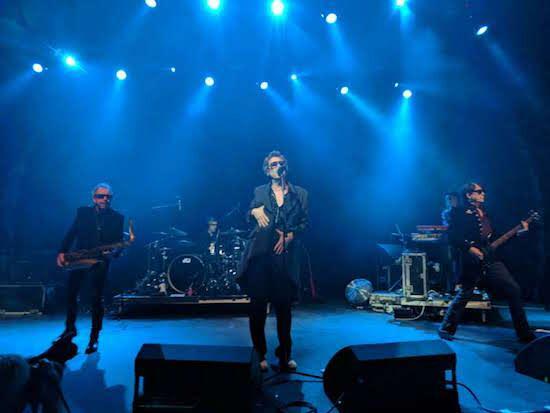 The Psychedelic Furs are alive with possibility right now, although it seems a strange thing to say about a band who haven’t really recorded anything since 1991. They are a beautiful zombie, meandering through north London garnering admiring glances, but the life force that drives the beast hasn’t truly stalked the earth since the last century. There are rumours of reanimation - there are always rumours - which we’ll come to in a bit. The Kentish Town Forum is a homecoming of sorts, and a tour of the 45s makes one appreciate what a great singles band they were throughout the 80s. It was an era where a number of alternative bands (The Smiths, The Cure, The Wedding Present) released a glut of great singles, and perhaps this reconfiguring of perceptions might mean a few people start mentioning The Psychedelic Furs in the same breath. Certainly they’ve never quite got their dues. The familiar snare thwack at the very start of ‘Pretty In Pink’ predictably raises the biggest cheer of the evening, and if it’s an albatross they’ve been wearing around their necks all this time, then tonight they wear it like an elegant feather boa. They’re more energised than when I saw them seven years ago at this same venue for a run out of Talk Talk Talk, and the possibilities we’ve spoken of are immediately palpable, teeming, elusive but all around us. Richard Lofthouse Butler is 61 now, and he’s looking good. Swishing around the stage like an agile man half his age, pouting and pulling Christ poses, he looks how Andrew Loog Oldham probably still looks in his dreams: whippet-thin in a long stylish coat, with art dealer rims and bountiful locks of hair. Perhaps all that swaggering around New York being debonair and doing a little painting here and there is the kind of lifestyle that preserves and prolongs. It all adds to the sense we’ve cracked open a time capsule and a potent force is emanating from its cylindrical shell. Tim, his brother, also has a certain vampiric sustainability about him, and it makes one wonder - in a week where another band of brothers, Sparks, released yet another album of vital material - whether the Butlers will pull off the same trick at some point. I’ve little time for nostalgia, but watching them tear through the hits tonight does make me think they should take the risk of adding to near-perfection by making a new album. I’ve loved the Psychedelic Furs since before I knew what 'psychedelic' meant, before I could figure out the fact that there isn’t anything remotely psychedelic about them. As a 13-year-old I discovered them like many others did thanks to a John Hughes film, and from there I worked backwards, becoming exposed to glorious post-punk grottiness for the first time, denuded of the shiny synths and parping so prevalent in mid-80s production. It was a transformative education. It’s the mid-80s material, with a more beefed up sound, that really cuts through this evening, rather than the angular, angry early stuff. ‘The Ghost In You’ is phantasmagorical, ‘Heartbeat’ - when the key changes - is deeply stirring thanks to Butler’s still remarkable vocal prowess (the band walk on to ‘Warszawa’, incidentally, in case you ever thought the Bowie inflections were just a coincidence). ‘Love My Way’ is thrilling rebalanced with some added grit, and one still wonders why they’ve never taken Electronic and Neil Tennant to task over ‘Getting Away With It’ (quite literally). ‘Heartbreak Beat’ is especially evocative and air-punchy this evening, too. When the re-recorded version of ‘Pretty In Pink’ lit up the charts in 1986, the Furs were in the unfamiliar position of being the zeitgeist. Whether or not they can capture that again is a question perhaps nobody can answer, although some may have insider knowledge. Tim Butler has hinted that they’ve been recording again, and if the few songs his brother has released in the intervening years are anything to go by then it’s certainly possible they can recapture something. Richard Butler’s eponymous solo album in 2006 was good, his track ‘You Need The Drugs’ with Westbam recorded in 2013 for the film B-Movie - spine-tingling, glassy, poignant and penitent - is one of the best things he’s ever done. Should The Psychedelic Furs capture even half the magic contained within its beautifully ambient four and a half minutes, then a properly executed full comeback might be something we can all get excited about. Suede have proved it’s possible to reappear and be as vital as they were during their purple period; Faith No More have come close to being as glorious as they were in their 90s pomp also. It should also be noted that while the Jesus & Mary Chain’s new album isn’t as good as their previous six, they seemed revitalised at recent shows, with Jim Reid out front without his guitar. And the Pixies, perhaps the bellwether by which all comebacks are assessed, having opened the floodgates with their reformation in 2004, haven’t really harmed their legacy with two so-so albums. They’re able to elevate the old stuff and arouse younger fans with the finer newer songs, and at least provide the pretext that we slightly older attendees are not all just here to secretly mourn our youths. If The Psychedelic Furs have barely released anything since 1991, then it’s not like the old material isn’t relevant. “It's sick the price of medicine,” spits Butler during the encore, “Stand up, we'll put you on your feet again / Open up your eyes just to check that you're asleep again / President Gas is President Gas again.” With a bloviating orange demagogue in the White House, ‘President Gas’ remains relevant. I have to vamoose before the second encore of ‘India’, having to find a train rather than find myself. And all the while my ears and body yearn for more.The Psychedelic Furs could go another 16 years without recording another note on this showing, but we want more. As I chunter away, the words from the beginning of ‘Dumb Waiters’ from the top of the show continue to ring in my ears: “Give me all your paper, ma / Gimme all your jazz / Give me something that I need / Something I can have.” The future is alive with possibility.